And When You Arm Yourself With This New Information You Can Have The Golfing Consistency Of Your Dreams Without Changing Your Swing, Spending Hours Practicing Or Getting Worse Before You Get Better! Why the majoirty of the golf industry actually wants you to remain inconsistent and not improve — and what you can do to make sure it doesn’t keep happening to you anymore. Why you’ve never found a long term solution to your consistency problems. 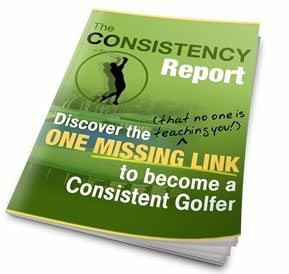 How virtually all golf instruction takes you further away from ever becoming the consistent golfer you dream of — and what you need to focus on to reach your golfing dreams. How to instantly swing with smooth, effortless power and deadly accuracy, without changing anything about your swing! What happens to cause you to go from hitting it great one second to hitting it horrible the next — and what you can do to stop that from happening. One secret technique you can use today to add 10+ yards to your drives. To read this special report right now to find out the one secret that no one else is telling you, simply put in your first name and email address in the form below and click the ‘Get Access Now’ button. Hope this has the answer to my consistency problems. It’s killing me right now! my consistency has been a problem for years. this better be the solution i’ve been looking for or i’m giving up on this game. it’s too frustrating hitting so many bad shots. I have wasted too many hours practicing and not improving. Can’t wait to read what you have to say. you bet I’m frustrated my game doesn’t get any better! i’ve tried it all….lessons (with some well known instructors too), gadgets, books, dvds. and on and on. you betta have something different here. I knew teh pro’s were hiding something from me. I often take a lesson and get a little better for a short time then get worse so I have to go back and shell out more cash. Can’t wait to find out what y ou’ve got. Consistency has been the bain of my golf game ever since I started. If you have teh solution I will kiss you!!! always nice to have some informations about golf, because it’s so f&^$#$##$@&**() havy to play good golf. Hello, It will be interesting to know what us golf instructors are hiding from our students. If you have a sound method I am all for it. I have tried to find ways to help all my students based on any limitations they might have. Teaching consistance is alway a main goal. I will check out your info and hope it is benefical to your students. Can’t wait for more info to help my game…..had three golf lessons and every time I got worse!! Interested to see what you have to say. There must be some reason why I’m not consistent. It can’t be me! Sounds good! I hope it does the job. I hope it’s not a little green pill ! Sure hope this helps a Senior!!!!!!!!! Consistency bothers most golfers, even the ones you see on TV. Hope this has the answer to my consistency problems. wow i am looking forward to read what was missing in my golf game…the secrets etc…i really hope this willl work cos i spent a very long long time trying to find the solution…i look forward to reading !!! I will thoroughly read and review the report. seems intriguing and yet promissing. Eager to consult the material as consistency is key to further enjoying the game. Willing to try anything that will work! Hope this is going to help, getting very frustrated. Hope it can help me to get better in golf game. Great report Jeff, I shall pass this on to my visitors and subscribers! Yes sir it is true that i have so many tips from pros telling me about this and that. I have a problem on my swing, in side and out side and my right arm didnt work as i down swing.And the ball hit slice,top ect.Feel bad and the feeling of frustration keep going on and on.For your information i am a left handed users, But i am still used a right hand golf set as i was start learn it before. And i start confuse with this all theory a bout golf. As i read your article yes i agree with what u said.. It is a mental game and should play it with it should be. Any how thanks for the tips, it helping me a lot and still looking for more advise from u becouse we really needs people like u to guide us playing with a happy feeling. Agains thanks alot, see u in next time. I’m very interested in what this report has to offer. Have got your program and am happy to say that it has helped quite a bit. I will say that any body that has a garage full of clubs and a shelf full of dvd’s etc with no results should buy this now. It really helps.